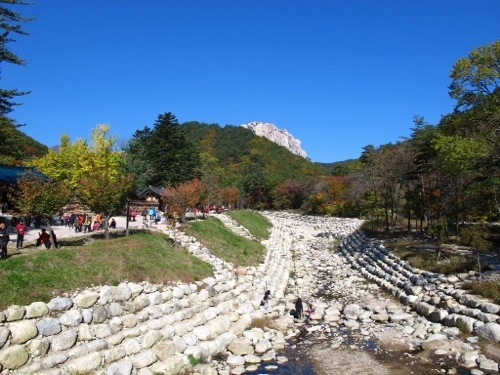 It’s a rather long drive from Seoul to Seoraksan National Park , like 3 hours or so on a good day. Slept through the ride — but despite the distance, this was certainly worth the trip. 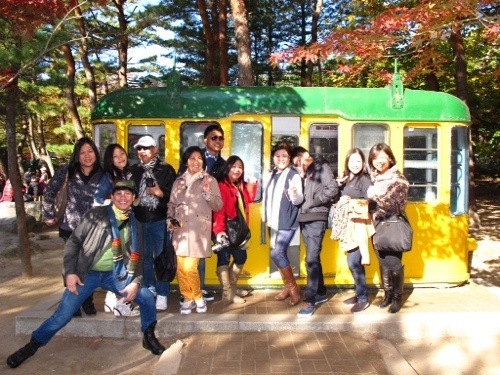 We had worthy pitstops along the way — Petite France early in the morning and Nami Island after lunch — so you can say we were kind of bug-eyed and feeling wrung-out wasted by the time we reached the mountain park. 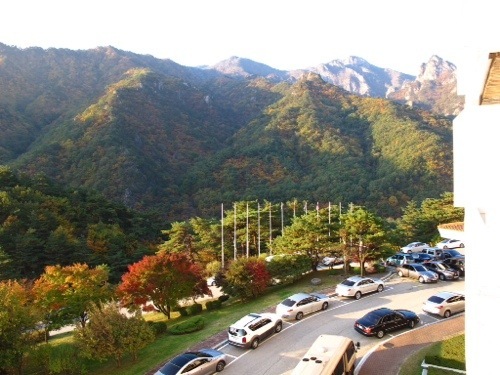 When we checked in at Seoraksan Hotel inside the Park, it was way too dark to appreciate the autumn foliage and jagged peaks. Mt. Seorak. My apologies for saying this : Awesome! View from our hotel room’s balcony. One Family Picture for posterity! The line for the cable car ride was “3 hours long”. 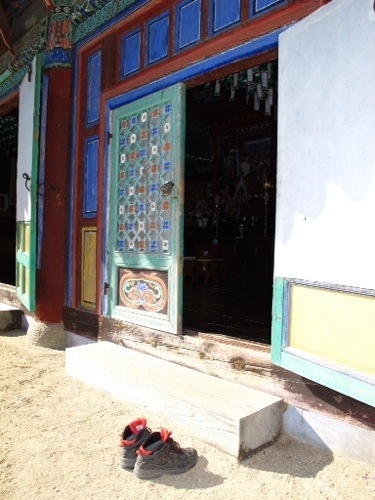 We decided to hike up to the Shinheungsa Temple instead and forego the chance to tread on stony paths where one enjoys unobstructed views of the mountainscape from rocky cliffs. The long line was a spoiler. But before long, we were already feeling uber-alert in an adrenaline-fueled overdrive. The giant bronze Buddha statue can’t be missed if one walks straight on from the park entrance. 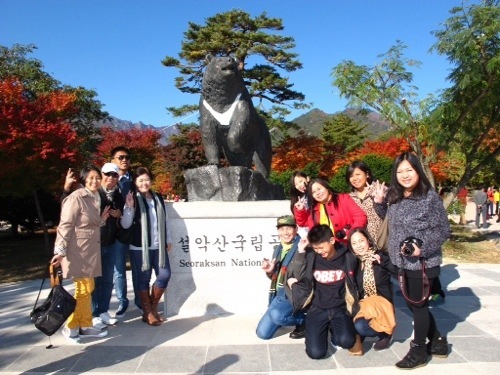 It is said that this statue expresses the wish of koreans for reunification. Interestingly, our own guide echoes this wish that one day, there would be just one Korea. Well-said. 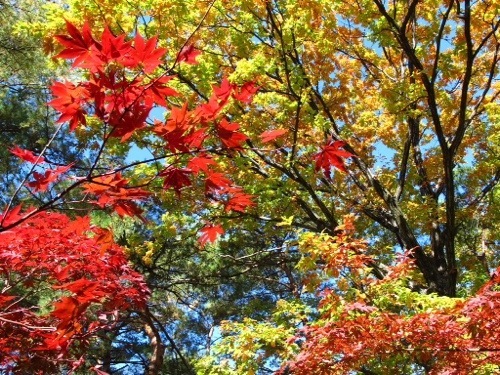 The vibrant hues of an Autumn foliage in Seoraksan National Park. 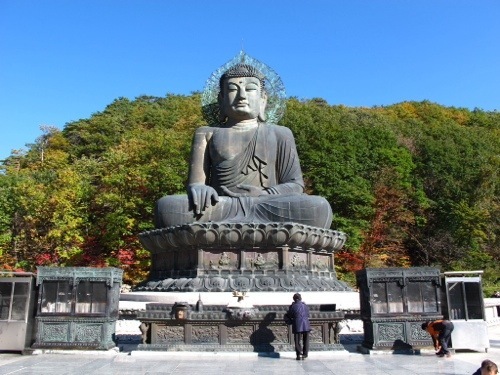 This giant bronze statue is called “Reunification Buddha”. 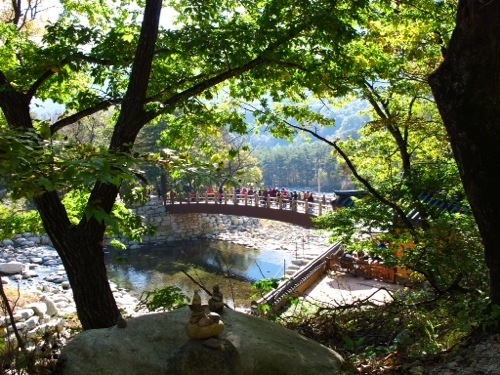 Seoraksan Park. 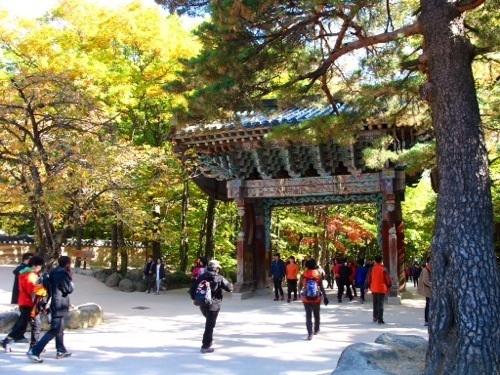 Just as the Autumn foliage floored us, we were awed by the colors of the temple structures inside the park. 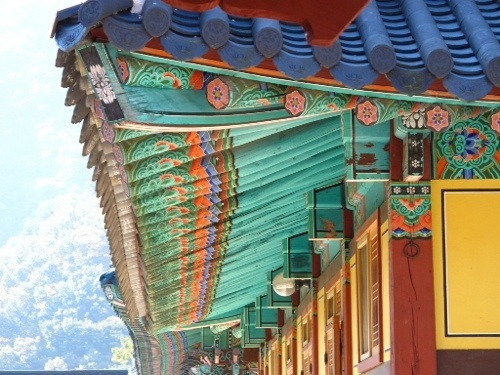 Not too far from the big Reunification Buddha, one finds a number of colorful structures comprising the Shinheungsa Temple. We crossed the gate guarded by 4 fierce looking “guards” and found many “prayer rooms”. Monks in gray here, in contrast to the many Buddhist monks I’ve met clad in thin orange or deep red outfits. The gray seems more “in tune” with the “Korean morning calm”, I dare say. The temple structures’ vibrant colors are a perfect match to this season’s palette of autumn hues. One of many prayer rooms. 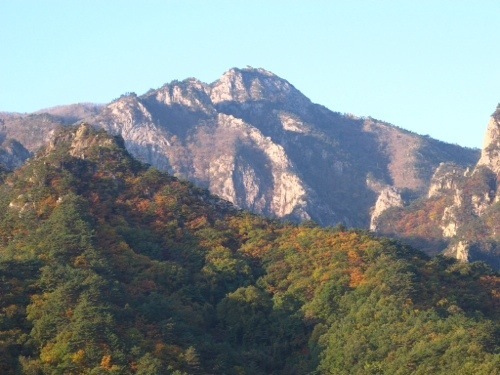 The stoney paths and jagged peaks of Seoraksan. Stone bridge inside the Park. To do justice to this lovely place, one has to do a leisurely stroll. No hikes!